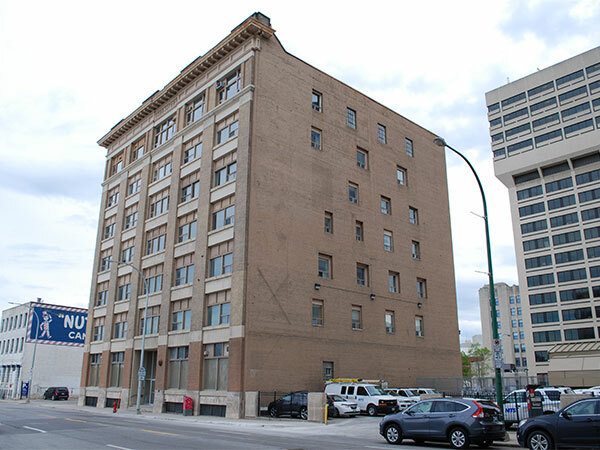 This seven-storey brick building on the south side of Portage Avenue East in Winnipeg was designed by local architect Herbert E. Matthews and built by James McDiarmid in 1909 at a cost of $265,000 for the Notre Dame Investment Company. Later transferred into the ownership of the Bank of Nova Scotia, in April 1928 it was sold for $100,000 to the partnership of Benjamin “Ben” Jacob (c1892-1975) and John Henry Crowley (c1889-1963) operating as the Jacob-Crowley Manufacturing Company Limited. It was later renamed the Crowley Building. In February 2017, it became a municipally-designated historic building. “Local notes [The Prudential Life Insurance Company],” Manitoba Free Press, 15 March 1910, page 7. “Notice of removal [The Standard Trusts Company & The Excelsior Life Insurance Company],” Manitoba Free Press, 24 March 1910, page 3. “The Prudential Life Insurance Company,” Manitoba Free Press, 25 March 1910, page 10. “Keewayden Blk. Portage Ave. E., sold for $100,000,” Winnipeg Tribune, 5 April 1928, page 1. “Firemen answer dozen calls over week-end,” Winnipeg Tribune, 23 April 1928, page 6. “Plant growth shows trend of local industry,” Winnipeg Tribune, 15 October 1928, page 11. “In respect to J. H. Crowley,” Winnipeg Free Press, 26 February 1963, page 5. Obituary [John Henry Crowley], Winnipeg Free Press, 26 February 1963, page 21. Obituary [Benjamin Jacob], Winnipeg Free Press, 29 October 1975, page 54. “The passing of Mr. Ben Jacob,” Winnipeg Free Press, 31 October 1975, page 27.